Posted 2009-02-07, filed under Economics, Intellectual Protectionism, Music, Peeves. Not entirely sure what you mean by whether or not any business model is necessary for music. Two points: just because you don’t need copyright, doesn’t mean a business model isn’t being used. Second: on the whole, you most certainly *don’t* need a business model to create and distribute music, but that doesn’t mean a business model is a bad thing. As for looking at examples outside the contemporary first world milieu, I agree… and have tried to do that at times on Techdirt as well. But, in this case, the folks at Midem specifically called me up and said “we want you to do a presentation on Reznor.” So that’s what they got. :) Would love to do a presentation that looks at alternatives outside the mainstream and modern day world. Just discovered your blog. Great to find another blogger who uses CC0 waiver. You might be interested in this list of notable works dedicated to the public domain. 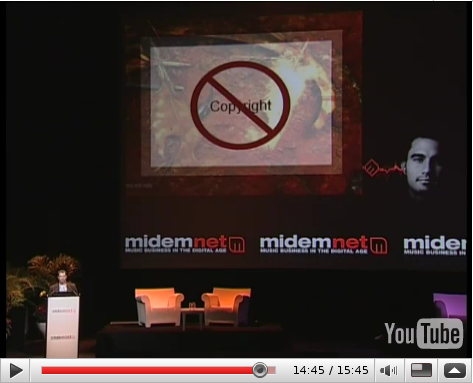 Mike, “most certainly *don’t* need a business model to create and distribute music” is what I meant. Here I’m almost exclusively interested in the public policy angle, which doesn’t (or rather shouldn’t) privilege producer welfare. Nothing wrong with having a business model that doesn’t depend on censorship or other exclusion.